Getting a gaming specific monitor is a great way to improve your gaming experience, enjoy smoother play, and maybe even play a little better too. But monitors can be pricey. If you’re looking to get yourself a great gaming monitor, but don’t want to be spending more than $300, then you’re in the right place. We’ve been looking at a bunch of different monitors this week. We wanted to find out what the best model under $300 was. After careful consideration (and looking through a whole ton of different ones) we’ve decided that the best Gaming Monitor under $300 is the BenQ ZOWIE 27″ Gaming Monitor. We were incredibly impressed with the BenQ and it actually improved how well we played, which certainly isn’t something you can say for most monitors. Before we actually got any of the monitors into the office to test them, we wanted to ask some serious gamers about the kind of things they look for before buying a gaming monitor. We wanted to find out (from people who spend 10s of hours every week gaming) the things that they thought were important, and the things they were less bothered about. Our reasoning here was that these people spend a ton of time gaming. So they’re going to know what they’re talking about, and they’re going to be pretty picky when it comes to their peripherals. They’d be able to tell us what was important and what wasn’t. And whether there were any particular models or brands to avoid as well. After surveying these gamers, we got this list of the 5 things they’re most interested in when purchasing a monitor. How well does the monitor play? We determined this final list by taking all of the monitors that scored well in the above categories. They were then brought them into the office and we tested them out ourselves! To do so, we had to do plenty of gaming, watching films, and listening to music videos on them. As you can imagine, this was very difficult work. It wasn’t long before we were absolutely exhausted from all the gaming. I didn’t want to play another round of Call of Duty, I really didn’t. But I knew that unless I did, I wouldn’t be able to adequately explain the full benefits of each of the monitors. So, I unselfishly continued playing. I sacrificed valuable time that I could have spent in meetings, or doing other office work, to play games instead. So I hope you’re grateful. While playing, we were looking to see how well the quality of each screen held up, often screens can look good initially but after prolonged play they start slowing down and getting choppy. This is why we had to spend so much time gaming….just to check. All the models that made it through to our final 5 performed extremely well in each of the categories we mentioned above. The most important feature for our gamers was how well the monitor played while gaming. This is very much related to a bunch of different monitor specs, but isn’t accurately represented by any single one of them. One of the key problems with normal monitors is that while their specs are excellent, and they produce a really good image, they can slow down and become choppy during really intense gaming. For someone who doesn’t game on their PC, this simply isn’t an issue. But for someone who does, it can be an absolute nightmare. The nasty thing about it is that it’s pretty much impossible to tell purely from the specs that come with a monitor whether it affects a particular model or not. So, it’s not as easy as simply picking a model with high Frames Per Second (FPS) and other similar impressive stats. Because although they can make a small difference, the problem is far more to do with the actual build quality of the model, and whether it’s been tested by the manufacturer during intense gaming. It’s nice then, to be able to do that testing yourself. Because you get a genuinely accurate idea of how the monitor holds up while gaming, rather than just getting the manufacturer’s say so. With all the models we talk about here, we did our own testing. So we know how well each of them holds up during intense play. They all performed well, and far better than the standard monitor. But some were definitely better than others. We’ll talk about that in the specific review for each model. All the gamers we talked to also regarded image quality as being extremely important. But being gamers, they didn’t think it was as crucial a feature a how well the monitor actually played games. People often consider image quality and screen resolution to be the same thing. And although they are certainly related, that’s actually not the case. Just like play quality, image quality is made up of a number of different factors, many which can’t really be quantified by stats. A lot of them again come down to build quality. It doesn’t matter how many pixels your screen has if the color bleeds all over the place. So once again, it’s difficult to know exactly how good a monitor’s image quality will be unless you try it out yourself. Luckily, we’ve done just that. All the monitors that made it onto our top 5 have excellent image quality. When we’ve previously asked groups of gamers about monitor size, we often got mixed responses. Half of the group would prefer having a larger size monitor in order to enjoy the game better. And the other half would prefer a smaller screen, as they found this easier to actually play on. This time though, our group was more or less unanimous. As much as was possible, they wanted a larger screen. Although I’ve heard arguments both ways. The gamers we surveyed said that bigger screens with smaller resolutions are the sweet spot. This makes it easier to spot enemies, and everyone knows that during shoot-outs the difference between winning and losing can be a few tenths of second. So they felt that having a larger screen gave them an advantage. This put us in a slightly difficult situation. Because larger screens tend to be more expensive, and our budget for these monitors was $300. So it wasn’t going to be easy to get really high quality, large monitors within our price range. So we tried to get high-quality monitors that were of a decent size. But we wouldn’t include a monitor that didn’t score well in the first two requirements on our list just because it was large. Because even if it was big, the playing experience would still be poor. The result of this was that the monitors we recommend here are all around 27 inches. So while they’re a decent size they’re by no means huge. This isn’t ideal, but we also tested a bunch of larger monitors too, and their overall quality just wasn’t high enough to recommend. So we had to go somewhere down the middle. Whenever you’re talking about expensive technology, durability is an extremely important feature. This is particularly the case with something like a monitor. Although they’re never going to be the toughest piece of kit (mostly due to the fact that they’re pretty much one big screen), you definitely want to make sure that yours isn’t overly fragile or prone to damage. I’ve seen expensive models take little knocks and crack in half, the color drain all out of others. A fragile monitor is definitely something to avoid. It’s not easy to test how tough a monitor is. As doing so runs the risk of breaking it. But we had a job to do. We didn’t smash the screens with hammers or anything, but we did give them a pull about just to see if the screens were overly fragile or seemed likely to crack. We also put in a call to some gaming enthusiasts we know and asked them about the durability of our monitors. We made sure that any of them that had issues didn’t make it into our top 5. To be honest, as long as my monitor isn’t actually embarrassing to look at, I don’t really care how good it looks. Our gamers though had different opinions, and a good number of them thought that how their monitors looked was a serious consideration. The problem was that they had vastly different opinions on what actually looked good. Some wanted jet black and sleek curves. Others were interested in a retro ‘square’ look and wanted a range of colors. To compromise we picked relatively inoffensive looking models. This might upset some of you looking for a more ‘hard-core’ appearance, but there was honestly such a divide between what people liked that we couldn’t possibly cater to all. So while these all look pretty good, none of them stick out massively. Out of all the monitors we looked at, our number 1 pick is definitely the BenQ Zowie 27″ Gaming Monitor . It’s just a sensational monitor. The first thing you notice when you switch it on to play is the color. It’s very vivid. In of itself this is a nice touch, but isn’t particularly relevant to gaming. It’s only when we actually switched it on though, that we noticed how much of a difference it made. Put simply, the highly vivid and distinct colors make it far easier to spot enemies than it otherwise would be. This is a genuinely serious advantage. Everyone’s played on a screen that’s just a little too dark. This makes it pretty much impossible to pick enemies out accurately, because the darkness just means there’s too little contrast. The Zowie’s screen is basically the complete opposite of this. Instead of being all the same kind of color, and therefore quite difficult to distinguish. The shades are all different enough that they’re easy to tell apart. This makes playing far easier, and gives you an advantage that you probably didn’t even think existed. It also responds quickly and none of our team experienced any choppiness while gaming. We all thought it played brilliantly. The image quality is also very good. It has 1920×1080 resolution, which looks great on the 27 inch screen, and as we pointed out early the colors on the screen are very distinct and pleasing to the eye. In terms of durability it’s a surprisingly tough build. There’s far less ‘give’ in the frame that you’d think, and when we asked our gaming enthusiasts, they only had good things to say about the build quality. So that was a great relief. It’s a nice looking monitor, but doesn’t particularly stand out. We probably would have liked it to be a little sleeker, but it performed so well in the other categories that we didn’t really care. It’s not the biggest screen we’ve ever played on, which is the one downside. And if you enjoy gaming on larger monitors then you might find this less than ideal. But it definitely makes up for this in just how enjoyable gaming on it is. So it’s easily our favorite. 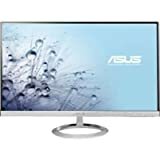 ASUS are a brand well known for producing excellent products, and this monitor is no different. It’s very smooth to play on, with really brilliant FPS and a quick enough response time that you’ll pretty much never have to worry about lagging. The picture is also extremely clear and it’s got the same size and resolution as the BenQ, 1920×1080 on a 27 inch screen. It’s extremely durable and we also thought it was actually a more attractive monitor than our winner. The only reason it didn’t make the number 1 spot is because it doesn’t have the same color contrast that gives you such an advantage playing online. But it’s still a fantastic monitor. In terms of aesthetics, this is the best looking monitor of the bunch. It has a gorgeous curved screen, sitting on top of a glossy white stand. The whole thing has a futuristic space-ship like appearance. It doesn’t perform badly in the other areas either. Playing on it is nice, the video stream remains smooth even during frantic play and the response times are noticeably fast. The image quality is good too, like other screens it’s 1920×1080, on a 27 inch screen this produces a great picture. We were a little concerned about the durability, just because the curved screen seems a little easier to accidently whack than the completely flat screens. We can imagine ourselves accidently putting an elbow through it at some point. Like the Samsung model we looked at above, the ASUS is fantastic looking, it’s super-thin, with a stylish base and a cool silver color. It doesn’t play half bad either. The gameplay is easy and fast, although it does seem slightly slower than some of the other models we’ve looked at. This wasn’t noticeable while watching films or anything like that. But when we were playing fast paced games, I could definitely notice that it was a touch slower. It’s probably not enough of a difference that you’d notice it a whole lot. But if you’re a somewhat competitive gamer, then the speed differential might bother you slightly. Apart from that it was great though. This Acer is a decent monitor. But offers a great example of a product that’s better on paper than it is in real life. The specs on this model are top-notch. It has a 144Hz Refresh Rate and a 1ms response time. The screen is 1920×1080. It doesn’t do quite as well though, when it comes to practical image quality. When we tried to watch films on this screen, everything went fine, but the colors just looked a little off. We tried adjusting them, but despite spending well over 45 minutes fiddling with the various controls, we weren’t able to get them how we liked. This problem was exacerbated when gaming, because the colors weren’t really distinct enough to pick out enemies. Depending on the type of games you play this might not be a huge problem. But considering there are perfectly good monitors on this list that don’t have this problem, why not just get one of them instead? Getting a good gaming monitor for under $300 isn’t easy. When picking you’ve got to balance price, performance and a load of other factors as well. But it wasn’t too difficult for us, because of all the ones we looked at, the BenQ ZOWIE 27″ was hands down the best. It offers smooth play, durability and a genuine advantage when playing too. The other monitors just don’t offer all that. Having said that both the ASUS VG278HV and the Samsung are great models too. So you wouldn’t go wrong with them, just as long as you know why you’re getting them instead of the BenQ. We take a look at the Best Gaming Monitors under $300 that will improve your gaming experience. Image Quality is very important when gaming, find out why.